Several weeks ago, I visited the redwoods on the Mendocino Coast here in California with a couple friends and their three-year-old son. I have traveled to the redwoods in other parts of the state, but these were no less majestic and awe-inspiring. Among these tall giants, this small hobbit pondered the beauty of creation and the immanence of God’s love in everything around us. Then the other day, a friend of mine posted on her blog an excellent response to the question, “Does God love trees?” which brought me back to my trip through the redwoods. She tackles the question in a very nuanced way, showing how all of His creation is imbued with His infinite love. So we must ask, “If that creation is filled with His love, should He not love even the trees, or should we neglect any part of His creation, even the part that resides outside of humanity?” The answer to both of these is, of course, no. I think the issue here comes down to this, and I know that I may get some flack for what I am about to say, but what does it mean to be pro-life? Being pro-life means protecting the innocent unborn. Being pro-life means preserving the life and well-being of the elderly. Being pro-life means feeding the hungry, helping the sick, sheltering the homeless. Being pro-life means finding constructive solutions for immigrants. Being pro-life means recognizing and cherishing the beauty of a marriage between a man and woman, and the spiritual, emotional, and physical bond that they share. We must uphold the dignity of the human person, from conception to natural death and everything in-between. But does life include not only humanity, but the rest of His creation as well? I would say yes. Unequivocally yes. As my friend pointed out, God’s love is infinite, so how can any part of His infinite creation NOT be loved? If we are serious about being Christians, we cannot pick and choose; sure we may have particular ministries or causes for which we are especially devoted. We must also know that while He loves all of creation, the love given to humanity is different than that to, say, trees. As Christians, though, we have a duty to be pro-life in every way. While we may each have our own particular focus and call to serve in a special way, the Church, the Body of Christ, is pro-life in every way: babies, immigrants, homeless, the elderly, the incarcerated, good stewardship… To be pro-life means to be pro-creation, and creation includes, well, just that: everything. We must maintain the dignity and beauty of all creation. Speaking of which, I came across this the other day while going through some old computer files. I think I wrote it a few years ago. Maybe I will make a monthly feature called “Bad Poetry” in which I can ensure my pride remains in check… Pax et bonum. Long emerald fingers sway in the breeze. Old man Willow stirs from his peaceful rest. His roots reach into the cool life-blood of the flowing stream. All are nearby, stirring, stretching. Old man Willow remains the first. Slowly, steadily, they all disappear. Pulled his friends from home. The ones pulling friends away, knowing no better. They debate – will old man Willow suffer the same? No, the young ones decide to let him be. Ruling Pine, fair Ash, confident Chestnut, all gone. Resting near the cool waters of his home. The stories are the same. 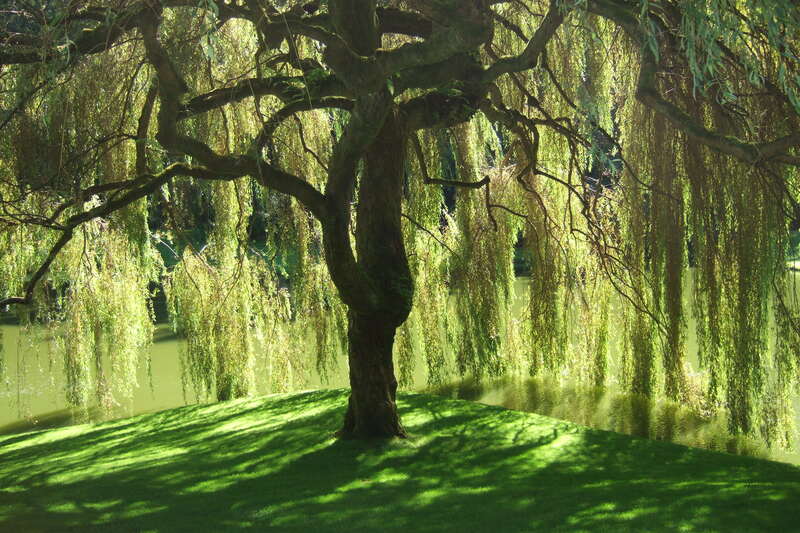 Old man Willow reaches deep, drinks the cool waters.